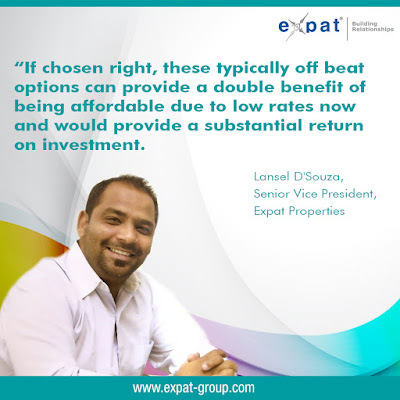 The Expat Compass: Lansel D'Souza, Senior Vice President, Expat Properties, on The Hottest Investment Destinations in India. 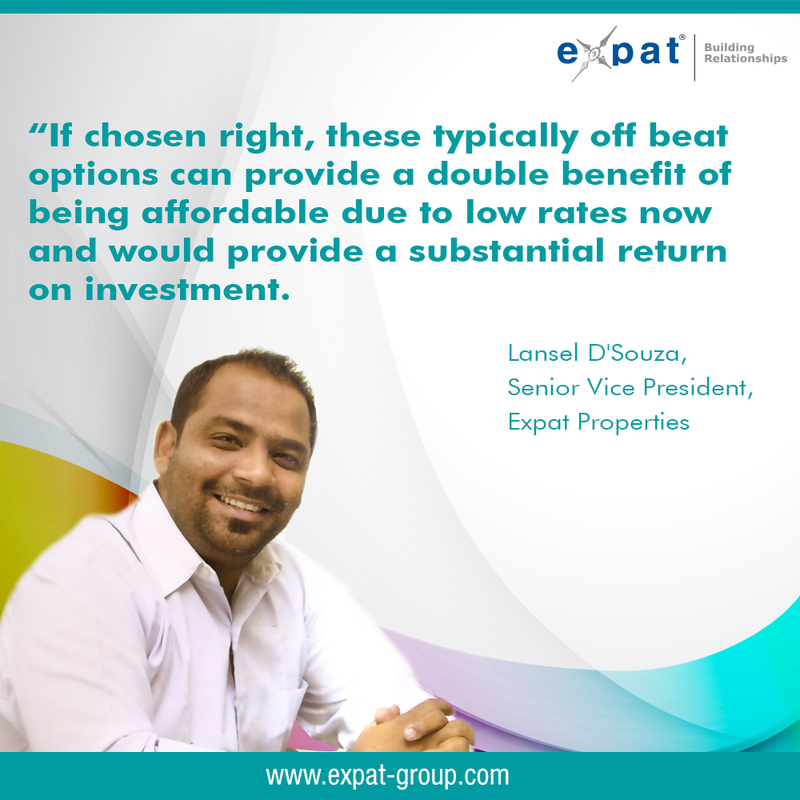 Lansel D'Souza, Senior Vice President, Expat Properties, on The Hottest Investment Destinations in India. Ever dreamt of owning a property in the uber chic locales of South Mumbai, or maybe the posh Lutyens estates in Delhi or even the residential stronghold of Indiranagar in Bangalore? For most, it remains a pipe dream. It's one thing to have the financial muscle to afford real estate in these localities, but you have to even pull strings, know the 'right' people and have a social standing to be considered a candidate for developers. For the majority of the aspirational middle class who dream of bolstering their financial and personal portfolio, is there then a different approach that could bring them closer to this dream? One place to begin with is the up and coming localities outside your mainstream metropolitan cities, which could result in substantial returns and also form a good future residential option. But buyers typically display hesitancy towards purchasing land in the outskirts of the cities. The primary reasons for their uncertainty are availability of basic amenities, the scope of economic and business growth, lack of entertainment and community options and the value of the investment. If chosen right, these typically off beat options can provide a double benefit of being affordable due to low rates now and would provide a substantial return on investment. Most of these locatlities are undiscovered location and have the huge potential for profits. Developers with a keen eye for future development plan projects accordingly and identifying them and choosing your localities well will define the success of your real estate endeavour. Be first to recognise the growth potential of these areas and invest wisely. We try and make it simpler for you through this article on some of the hottest investment destinations across 4 states of India. Lepakshi is a charming area in the Southern state of Andhra Pradesh, 15 km east of Hindupur and 120 km north of Bengaluru. Not only is Lepakshi deep rooted culturally, but it is making a mark economically as well. Due to its proximity to important metros and industrial hubs combined with ease of accessibility, this area has great scope for real estate investment. The area is very close to the national highway, adjacent to the upcoming Lepakshi knowledge hub and only 50 minutes away from Bengaluru international airport. The unique point of this area is the fertility of land, development in nearby sectors and convenience as basic civic amenities are available. Lepakshi knowledge hub, which is a key highlight of the growing economic prowess of this area includes an Aerospace and Defence centre, education and innovation hub, free trade warehouses, health and wellness centres, a media and entertainment city, global village to name a few. The area is viable second home option for developers who already have projects or land in Lepakshi as it has availability of underground water pipe, electricity lines, fencing and fertile land. The Indian Institute of Science, Hindustan Aeronautics Limited, Bharat Electronics Ltd, DRDL, Bharatiya Agro Industries Foundation and Electronics Corporation India Limited are proposing to set up their units within the Lepakshi Knowledge Hub. Airbus, commercial aircraft manufacturers, also have proposed to set up shop in the area. Anantapur has potential of becoming an industrial hub for aircraft parts and maintenance. The growth rate of the location is promising as the scope of further development is high. Dharmapuri is a district situated in the northwest corner of Tamil Nadu, which came into existence in the year 1965. The present Dhramapuri was part of Salem district and even under British rule it was part of Taluks of Salem District. Investing in this location promises high returns, because of several places of interest like Hogenakkal Falls is 46 km away from the district. The location is currently under the Free Zone until explicit permission is being granted by the government to change it. The unique aspect of this area is the affordable rates. Investing in this area is easier because of clear titles and the land is close to major economic growth zone. Coupling this with the choice of an experienced and trustworthy developer will more or less ensure that the investment will be fruitful due to the massive scope of development. The NH 7 road is also being upgraded which will impact the connectivity and the road will bypass Dhrampuri, Kaveripattanam and Periyampatti on its way to Salem. Tanflora Infrastructure Park promoted by the Tamil Nadu Industrial Development Corporation adds another dimension to Dharmapuri. The venture promotes floriculture near Hosur and Tamil Nadu area, providing infrastructure, post harvest logistics and marketing facilities. Bagepalli is a municipal town situated 100 km north of Bangalore and located in Chikballapur district. The destination is perfect for a weekend getaway with rich historical significance. Gummanayakana Palya, 20 km from Bagepalli, is comprised of Bagepalli Taluka portions of Hindupur and Kandukur in the Presidency state of Madras. Investing in this location will lead to good returns with purchase at low prices. All the basic amenities like water, electricity, medical centre and others along with infrastructure necessities are present in the town. The location is a mere 6 km away from Bengaluru- Hyderabad highway (NH-7) and 75 km away from Bengaluru international airport. KIADB (Karnataka Industrial Areas Development Board) has already acquired approximately 1000 acres for a major industrial plant in the vicinity which will lead to the rise of a prominent industrial hub in the future. The area has promising investing options for land, residential and vacation homes. Purchasing or investing a project in this area makes sound investment sense as the area is on the verge of industrial and government development. Connect with a developer who has a presence in the area as they can provide more amenities and fencing. Pavlani Village is located in Ratnagiri district of Mandangad Taluka. The area is a popular tourist belt with a rich heritage. One of the favourite attractions is Harihareshwar beach which is surrounded by four hills. The primary rationale behind investing in this location is the threshold of developmental activities going around the area and around Dapoli. With the building of the Mumbai Sawantwadi Expressway going on, the proximity and connectivity will enhance. Another growth trigger is Dapoli place, which is few hours away from the location. The location of hills gives opportunity for adventurous sports and camping. The amenities are present and the land is suitable for agriculture. It is an ideal investment option, especially for those looking for investments close to Mumbai and Pune cities in Maharashtra. Dapoli is another town near Pavlani village, which has one of the oldest schools and notable agricultural university, Dr. Balasaheb Sawant Konkan Krishi Vidyapeeth. The area is undergoing development plans by the government and private players. The prices are low and have great potential for profits. While there are many such hidden real estate gems across India with high growth potential, it takes an experienced eye to identify potential before it becomes mainstream knowledge and reaches saturation point, a feature you may have experienced regularly with suburbs outside the metros. Apart from identifying these locations, it is imperative that you choose a developer who is trustworthy by virtue of experience and past credentials in these locations so they know market movements and trends early on. Choose well on both fronts and there could be a financial windfall coming your way.